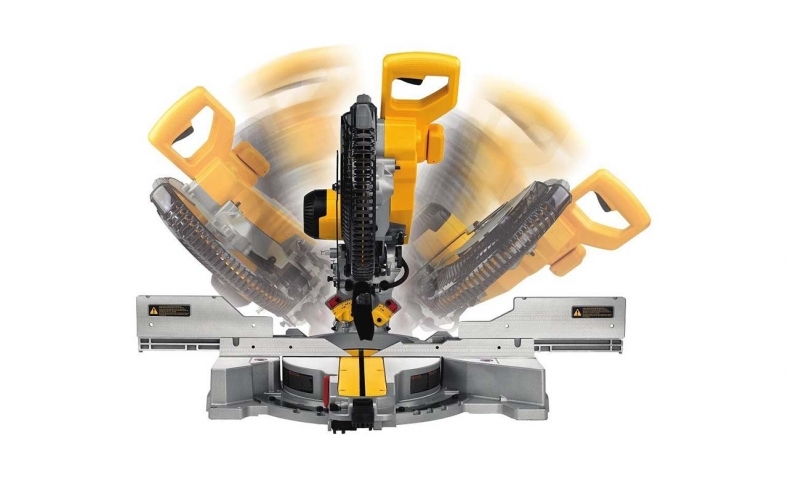 The Dewalt DWS779 is a great all-around miter saw. 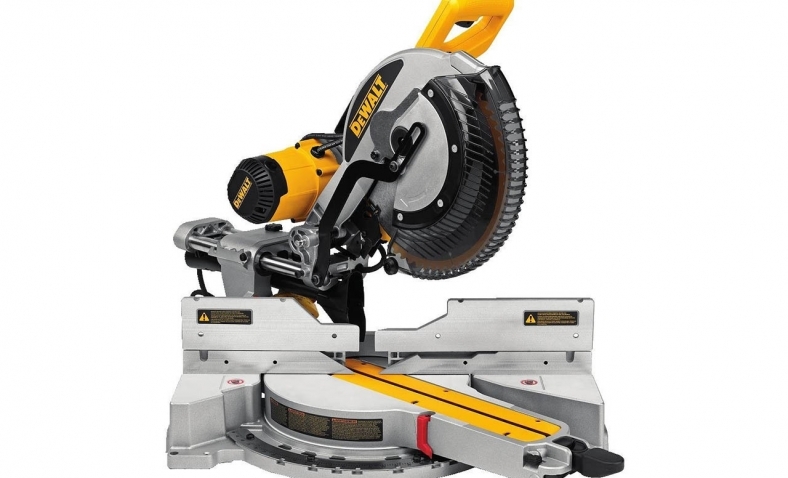 The Dewalt DWS779 is a 12” double bevel sliding miter saw designed to cut lumber. The combination of the back fence design an slide mechanism allow for 90 degree cuts of 2×16” lumber and 45 degree cuts of lumber up to 2×12”. 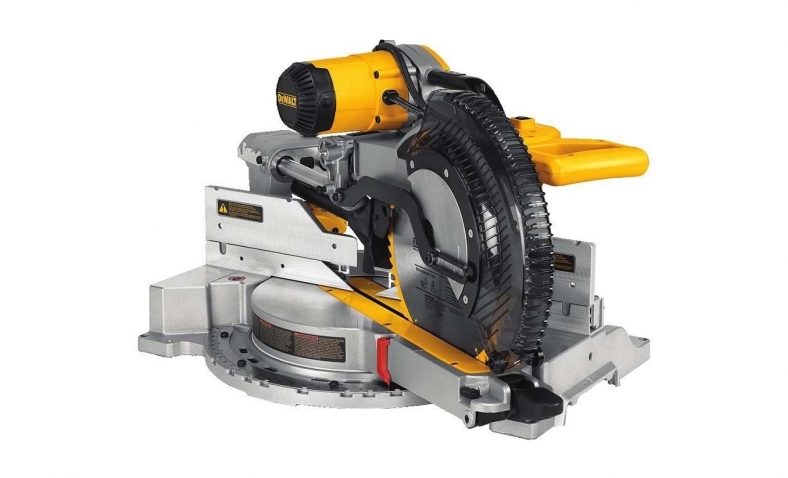 The saw is powered by a 15 amp, 3800rpm motor for power and durability. The belt drive system works well and powers the blade through cuts. The included blade is adequate at best but a job specific blade will yield much better results. The tall sliding fences will support crown molding up to 7 1/2”, nested base of up to 6 3/4” vertically against the fence while being able to slide for bevel cuts. It will miter 60 degrees to the left and 50 degrees to the right for increased capacity. Adjusting the angles is very easy with the miter handle. It features a cam lock with a decent override to make sure it accurately holds the miter angles. Using the saw is simple and the machine moves easily with very little effort required. The blade guard, while safe, does require positioning to be able to clearly see where the cut is happening. The cuts on the test 2×4” lumber were pretty effortless and the saw handled it without breaking a sweat. The saw advertises itself as collecting 75% of the dust generated. While the saw does collect a fair bit of dust, I would say it’s probably closer to 60-65%. The dust bag is a bit on the small side and does need to be emptied from time to time. A vacuum or dust collection system should yield better results. I believe this is a great all around saw for seasoned carpenters and DIYers alike. It does lack a laser to mark where the cut is but most carpenters I know don’t trust those anyway. I’m not sure there is a better value on a professional level miter saw out there right now.